Found anywhere and everywhere expect for the deep sea, lichen is easy to ignore, especially in London. Ranging in size from the small to the microscopic, you’re more likely to mistake it for a smudge, stain or some discarded gum than a colourful symbiotic coupling of fungus and alga. Only if you peer at it in extreme close up will you witness lichen’s intricate frills, rusty blisters and barnacle-like swellings. Able to grow where it’s likely nothing else would, urban areas can be great for lichen. There’s not much else able to make a happy home on park railings, parked cars, pavements or drain covers. 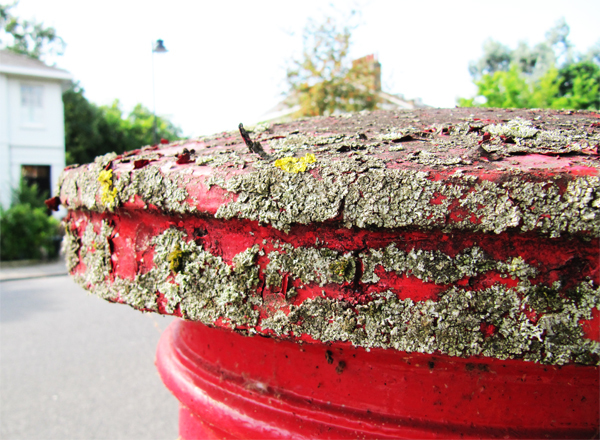 There’s a trio of red pillar boxes I know – one in Hackney, one in Islington, one in Camden – that all have peeling tops deliciously spotted and splashed with green-grey and ochre yellow lichen. Nitrogen lovers, Phaeophyscia orbicularis and Xanthoria parietina are in pole position on the roadside post boxes to be covered in nitrogen-rich dust created by cars. Each lichen species has distinct preferences, which means their presence tells a story about the environment where they grow. The acidic bark of a pretty cherry tree in Southwark Park has no lichen, except in the high nitrogen area around the bottom where the local dogs like to wee. There, more green-grey Phaeophyscia orbicularis blooms. A neighbouring plane tree sports over six different types, including the now ubiquitous Hyperphyscia adglutinata, the so-called pollution lichen. And a low wall nearby has a powdery apple green coating of Lepraria, the only lichen tolerant of the potent acid rain that poured down a few decades ago. A recent air quality survey by citizen science enthusiasts OPAL (Open Air Laboratories) drew in 4,000 results, mostly from urban areas. Surprised and inspired by city dwellers’ eagerness, they’ve just published an ‘urban lichen key’ in partnership with the Field Studies Council. It’s designed to help ordinary people identify which lichens are growing in their areas. At a time when London leaders are being repeatedly criticised for the poor state of the air we breathe, the stories lichens can tell are more relevant than ever. The survey shows nitrogen-loving lichens are increasingly widespread in both rural and urban areas, where nitrogen levels are high due to ammonia from intensive farming or nitrogen oxides from heavy traffic. London used to be something of a lichen desert but nitrogen-sensitive lichens can now be found, probably because of a decrease in sulphur dioxide pollution. But it’s the nitrogen lovers that are most common. Since London is one of the worst cities in Europe for air pollution, this isn’t surprising. So, what exactly is lichen? Before the invention of the microscope they were believed to be plants, but strong magnification revealed them to actually be two organisms living in close partnership. The fungus acts as the body, providing the alga with protection, while the alga provides the fungus with food. Brightly coloured lichens may have pigments in them that act like sunscreen, protecting them from bright light and UV rays. They absorb water, nutrients and pollutants across their entire surface, which makes them excellent bioindicators and useful for interpreting environmental change. Branched, stalked and bushy ‘fruticose’ lichens have the greatest surface area of all and are only found in places with clean air. They abound in north west Scotland, where they give forests an underwater aspect, but they’re hard to find in London, although Usnea sp. has been spotted at Kew Gardens and Evernia prunastri in Regent’s Park. More than mere observers of the world going on around them, lichens offer nest making material to goldfinches and camouflage to moths. They only gently anchor themselves to the substrates where they’re found and don’t cause structural damage, although they are credited with being important in the early stages of soil formation, as well as consuming carbon dioxide. Alongside these important, practical things, lichen also give a place character and texture. An interest in lichen requires slow, close observation and leaves you with a deeper understanding of your environment. With a hand lens, a black skid on a paving slab is transformed into Verrucania nigrescens and a few spots of dust become Lecidella stigmatea. On your hands and knees, or with your nose pressed against trees, lichen spotting offers a whole new level of intimacy with natural London.